Newcastle United Football Club has unveiled a permanent memorial to supporters John Alder and Liam Sweeney, who were among the 298 passengers killed when the Malaysia Airlines flight MH17 crashed in eastern Ukraine. The Alder Sweeney Memorial Garden, which has been constructed in front of the main Milburn Stand at St. James’ Park, will stand as a lasting tribute to John, Liam and all Newcastle United supporters who have sadly passed away. Club officials including former captain Bob Moncur were joined by the families of John and Liam for a private ceremony with a blessing of the memorial garden made by Newcastle United’s club chaplain, Rev Canon Glyn Evans. John and Liam were on their way to watch the team’s pre-season fixtures in New Zealand when they lost their lives. 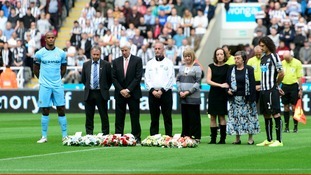 The two, who were well known to many of the club’s staff, players and supporters, were remembered at Newcastle United’s first home fixture of the 2014/15 season against Manchester City, with wreathes laid by their families, captains Fabricio Coloccini and Vincent Kompany and representatives of Sunderland AFC prior to a minute’s silence. As well as forming a focal point for remembrance, families and friends of supporters who have passed away will also be able to lay flowers and spread ashes at the Alder Sweeney Memorial Garden. Ahead of Liam Sweeney's funeral today his father, Barry, has spoken of his heart going out to the "298 families" who are mourning their loved ones who died in the MH17 plane crash. Liam died alongside fellow supporter John Alder in the Malaysia Airlines crash. His family and friends are gathering at St Mary's Cathedral in Newcastle today. Speaking to ITV Tyne Tees yesterday (Wednesday, 20th August), Barry Sweeney reiterated his hopes that Liam's funeral would be a celebration of his life and not focused on his death. Liam died alongside fellow supporter John Alder in the Malaysia Airlines crash. His family and friends are gathering at St Mary's Cathedral in Newcastle. The funeral of one of two Newcastle United fans killed in the MH17 plane crash in Ukraine will take place today. His father Barry says the support they have received from around the world has been "phenomenal" and he hopes the funeral will be "a celebration of Liam's life." Prince Charles has written a personal letter to loved ones of MH17 crash victim, Liam Sweeney. The 28-year-old’s father Barry said he was "very grateful” to receive the signed letter from the Price of Wales and his wife Camilla. The Prince has offered his condolences to the 52-year-old and his family, who live in North Tyneside. The family of Liam Sweeney are making the final preparations for his funeral service. A service for the Newcastle United fan, who died alongside fellow supporter John Alder in the Malaysia Airlines crash, will be held at the city's St Mary's Cathedral on Thursday. His father ,Barry, says the support he has received from all over the world has been phenomenal. A minute's silence was impeccably observed at St James' Park as Newcastle United paid tribute to Liam Sweeney and John Alder. The families of both men were invited onto the pitch to lay wreaths alongside former Sunderland goalkeeper Jimmy Montgomery and both team captains. "Liam and John will be cheering on from heaven"
The father of Newcastle United fan Liam Sweeney says his son and fellow fan John Alder will be "cheering on from heaven" this afternoon. Barry Sweeney was speaking from his son's seat - ahead of the game with Manchester City. Tributes are planned ahead of the match and fans will hold applause on the 17th minute.